I had the pleasure of interviewing Tyler Kirsch. 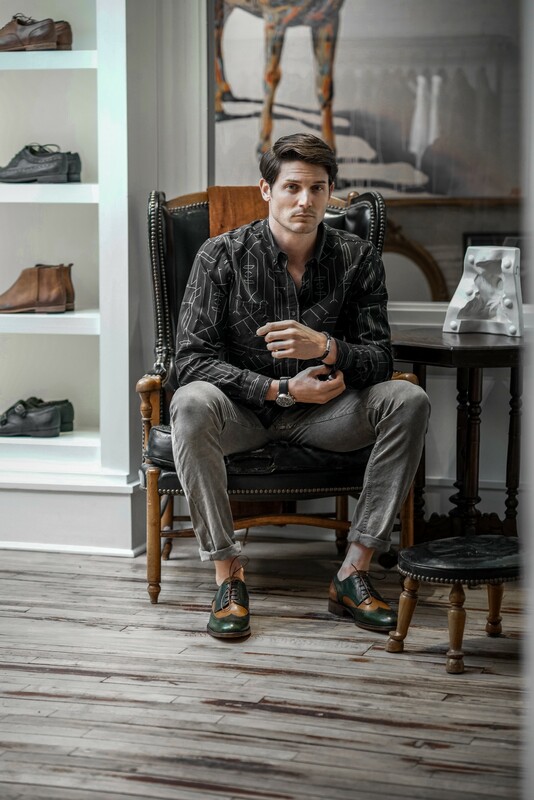 Since founding Eredità Shoes in 2016, Tyler has been bringing luxury, Italian craftsmanship to the men’s footwear industry. Having experienced the difference of handcrafted footwear on the streets of Florence firsthand, Tyler was eager to share this gorgeous gift with the rest of the world. By combining his love for Italian artistry and entrepreneurial spirit, Kirsch is now embracing a modern approach to the art of Italian craftsmanship; offering luxury Italian-made footwear at a contemporary price point. The vision for Eredità Shoes came to me while walking through the streets of Florence on a mission to find myself a great pair of shoes. I came across beautifully handcrafted, Italian leather products on nearly every corner and spent the day in various shops. After hours of searching, I found just the pair at a small family-run cobbler shop. As I sat there thinking about my experience, I realized I needed to share the gorgeous gift of Italian craftsmanship and personal touch with the world. Can you share the most interesting story that happened to you since you started? As I’ve gone through this journey, I have had the opportunity to meet some amazing people. From professional athletes, actors, and musicians, to the everyday working person. I think one of the most interesting people I’ve met through this journey is one of my shoemakers, Pina. The first time I met Pina and her husband, Francesco, I was at their home in a small Italian countryside. They welcomed me like family, we shared a meal, and spent the entire day together discussing their history of shoemaking, their family, and life in general. Her mother, sister, and daughter all joined us and spent the remainder of the day cooking an amazing traditional Italian meal (it felt like we had 10 courses, complete with wines that Francesco had made himself, some as old as 40 years!). The first photoshoot I did for Eredità was something. I thought I could manage the shoot myself and had some friends as the “models” for the shoes. It happened to be a beautiful Chicago day, sunny and 90 degrees, as we ran around the city with suitcases of clothes and shoes, sweating like crazy. The shoot turned out fine, but it taught me to trust in others and find help where I need it. You have to give up control of things and admit you don’t know in order to truly succeed. Needless to say, I now have plenty of help for shoots! All of our shoes are made in small, family run factories in Italy. No express lines cranking out shoes 10 or 100 at a time. These shoes are made by hand, by people who have been doing this for decades. This allows us to offer a truly one of a kind shoe. Sure, someone else may buy an Espresso Pascale (dark brown penny loafer), but those two individual shoes will each be hand-stained and have small individual details that the other shoe doesn’t. I once had a customer ask me for a shoe to match his coffee table, he wanted a deep cherry red for his brother’s wedding. So he text me a picture of the coffee table and I sent it to the shoemaker who then stained a piece of leather and sent me a picture back. The customer approved the color and the shoes were made! Continue to do what makes you happy — you don’t have to be all things to all people. It’s simple and cliche, but it’s true…find something you love and be the expert at it. That’s why we don’t have 100 different styles; I have found the styles I love and the shoemakers that I want to work with to create those styles. I believe we are experts in these styles and I think our customer feedback confirms that. We donate to a handful of charities every quarter for their silent auctions. Almost always, when we are approached the answer is yes. We’ve donated to The Red Cross, The Human Rights Campaign, Project Style, The Seal Fund, The Anthony Rizzo Family Foundation, and The Leukemia & Lymphoma Society. I have always tried to follow the “Golden Rule,” treat others the way I’d like to be treated. Growing up, we moved around a lot. I went to six schools before college, so every time we moved I was setting out on an adventure to make new friends, in a new school, in a new city. That’s not easy to do if you’re not going to be nice to people. I look back at my childhood and realize that a huge reason why I’m able to talk to people at networking or charity events that I attend without knowing anyone. People respond to kindness and interest, and when you give that off you tend to get it in return. Do you see any fascinating developments emerging over the the next few years in the fashion industry that you are excited about? Can you tell us about that? I am really enjoying the trend of people embracing who there are, and doing what makes them happy. Wearing what they are comfortable or confident in and what they want to wear…rather than what they think they should be wearing. There seems to be a new sense of individualism in the fashion industry right now and I hope to see that continue, and I hope to be able to invigorate that sense of individuality in my customers as we do more and more custom shoes. What are your “Top 5 Things Needed to Succeed in the Fashion Industry. Please share a story or example for each. You define your style, nobody else so be true to yourself. Every industry constantly evolves and seeks improvement. How do you think the fashion industry can improve itself? Can you give an example? I would love to see more and more diversity in fashion. Seeing companies with a staff comprised of various of ages, races, experiences and backgrounds, sexual orientations, and so on is a beautiful thing. The best part about our world is the individuals who make it up, if we lose that individuality — we lose style and fashion. I would love to see a bigger emphasis on educating ourselves about mental health in our country. I think that everyone from young children, to adolescents, to adults and veterans returning from defending our country struggle through the day to day obstacles and sometimes feel overwhelmed beyond repair. My first realization of the lack of mental health awareness was when I found myself learning about the experiences of people very close to me. I have learned that simply talking to someone about what’s going on in your head can make a world of difference. When you are educated about the struggles of mental health, you can be a much more supportive friend or family member. I believe raising awareness and educating ourselves is a first step in creating a larger movement that can bring the most amount of good to the most amount of people.